io, per primo, annuncio l'arrivo della primavera. e con identico slancio spuntano foglie e fiori. Already in the first lines of this picture book, we are projected in another dimension. The world appears different when seen from the branches of a horse-chestnut tree: seasons rotate with the change of its foliage, life runs in an almost suspended rhythm as who tells our story has lived a centenarian life, and days' frantic passage doesn't really matter to it. Though this is not a horse-chestnut tree like others, it is not just the narrative voice of our story it is, first of all, a memory bearer. We might quite fairly ask ourselves: which kind of memories could a tree have? What could have touched a horse-chestnut tree, in the slow flowing of its life, at the point it decided to tell us about its remembrances? Well, this horse-chestnut tree has lived all its life in a garden, at 263 Prinsengracht Street, in Amsterdam. Now the picture starts to be clearer but it's not well outlined yet, still we cannot understand what could be so important, in the memories it has so carefully kept for all this time. With its undefined rhythm, the tree tells us we are in 1942: the world is shaken by a "terrible ill", ruled by unfair laws, people who once were normal now act like crazy. Those who are submitted to the new, tough, laws find no escape, they hopelessly try to find a way out: some through escape, others hiding away from the rest of the world. quando arrivano nella soffitta della casa di Prinsengracht. Before we will get to know her name, we will know about her feelings, her sensations, her ever changing and contrasting moods, we will know about her struggling. For the very first time, we will see our horse-chestnut tree through her dreamy eyes, glancing through her 'cage bars', longing for freedom, blue skies and seagulls flying in boundless space. We will first read about her perturbation while, looking through the tiny window of the attic, she perceives the world getting even more so miserable and naked, in feeling death looming over her. We will first see her participating, from her hidden corner, to the pains of the world: as there is no shut door that can stop these from invading everything. It is once again Anne's voice, Anne Frank, that comes to us through different paths: filtered, this time, by the sensibility of two exceptional artists such as Irène Cohen-Janca and Maurizio Quarello. By twisting perspectives of such a well-known story, they succeeded in returning it to us even richer, more touching. The stillness that holds the horse-chestnut tree is the same that imprisons Anne: obliged to look at each other, narrating subject and protagonist reveal themselves, their true nature, under our helpless eyes. There is no possible action they can do to change their condition, the only possible action lays in the power of view, last bulwark of freedom. The tree is sick, it will certainly die, this is the reason that pushes it to tell us about what it witnessed. Anne is prisoner, she will be caught and transported in a much worse prison. Anne will die as well, we already know this. So, why telling this story again? Does it tell us anything different? Nothing and everything I shall say: nothing because we already know Anne Frank's story, everything because the reason of life itself lies in experience, memory and witnessing. The small sprout that will be saved from the horse-chestnut tree of 263 Prinsengracht Street will become a new tree, but not a tree like others: it will become the memory horse-chestnut tree. 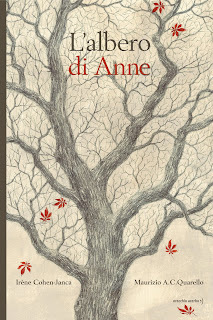 "L'albero di Anna", texts by Irène Cohen-Janca, illustrations by Maurizio A.C. Quarello, translation from French to Italian by Paolo Cesari, Orecchio Acerbo Pub., 2010. Original text published by Éditions du Rouergue in 2009. I wish every kid had this book in their bookshelves: it is a real masterpiece of poetry and images that will be very hardly paired. Irène Cohen-Janca's texts gently transport us through the story, with endless tenderness and no subsidence. The art of Maurizio Quarello reveals the story with vibrant sensibility, confirming the incredible talents and versatility of this artist. I wanted to send a special thank you to the guys at Orecchio Acerbo for allowing me to use the images of this post and, once again, for bringing to Italy a masterpiece from beyond the Alps. Copyright© text and images Orecchio Acerbo Publishing House 2010. Images have been reproduced with the permission of the Publishing House. Original text published by Éditions du Rouergue, 2009. I, the first, announce Spring. and with identical impulse flowers and leaves sprout. I am a horse-chestnut tree." a little hope and beauty." when they arrive in the attic of Prinsengracht Street's house. she received it for her thirteenth birthday..."
Thank you for reviewing this book and writing about with such attention and love. Hi Rob! Thanks to you! I'm always afraid to mistranslate... :-) It makes me very happy to know the message arrives correctly! Paolo Antonio Livorati: MISSION TRANSLATOR!